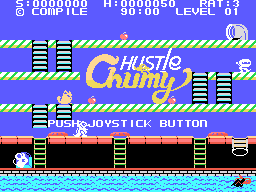 Hustle Chumy (ハッスルチューミー) is an SG-1000 and MSX game developed by Compile and released in 1984. In Hustle Chumy players control a mouse named Chumy who needs to collect apples (and other food) in a sewer, avoiding other critters as he goes. As Chumy eats more food, his speed decreases, but his fireballs are given a longer range. Levels have varying layouts. There are several types of enemies in the game, most of which can be defeated with fireballs. Bats: Bats fly over Chumy. Mecha-Dinos: Mecha-Dinos are indestructible, although Chumy can slow them down with fireballs. Gators: Gators usually sleep in one spot, but sometimes move slowly around. Cats: Cats can jump like Chumy. Ninjas: Ninjas need to be hit with three fireballs to be defeated.